Today I photographed two little people with BIG personalities. 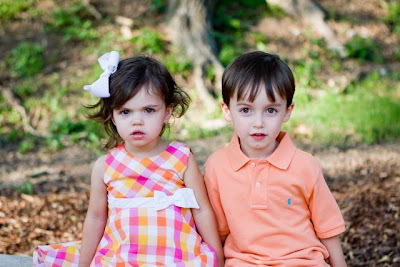 My friend's niece and nephew were the adorable models. We went to a local park and the kids pretty much just did whatever they wanted. Seriously, even when trying to pose them even just a little....they still did whatever they wanted :P That's what kids do though!!! I commend all children's photographers because that job is tough! Anyway, I'm posting one image today since I have some editing to do before posting the rest. Aren't they cute?